ME/CFS South Australia Inc: From Blog To Blockbuster For Welsh Woman? Home > In the News > 2019 > January > From Blog To Blockbuster For Welsh Woman? From Blog To Blockbuster For Welsh Woman? and has just written her first novel. From blog to blockbuster for Bridgend woman? Copyright & Trade Mark Notice & 2013 - 2019. A young writer and blogger from Bridgend has just published her debut novel. Rachel Jeffrey, 20, says writing has provided her with a welcome distraction from the medical problems she faces. 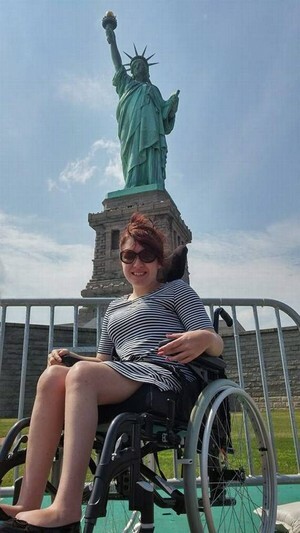 She said: “I was diagnosed with cerebral palsy at the age of two. Then in 2011, I suffered an accident when I fell out of the back of a minibus at school. Rachel has also been diagnosed with chronic fatigue syndrome and facet syndrome. Despite her physical difficulties she produces a stream of cheerful blogs at rachelmwriter.com to encourage other people with disabilities. Reading and writing have always been an important part of her life.